So, the Pac-12’s got problems. It’s time for Larry Scott to fix them or it’s time for somebody else to take his job. So, the Pac-12 looks ridiculous right now due to this whole Ed Rush “bribery” scandal. 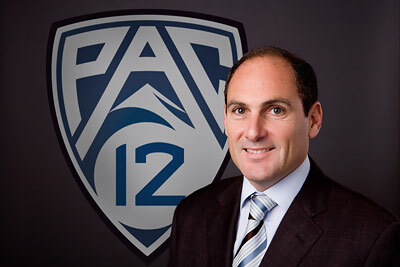 And nobody looks worse right now than Pac-12 Commissioner Larry Scott. But let me back up a bit. Scott has received tons of accolades ever since he announced a massive $3 billion/12 year contract with ESPN & FOX. It was a huge coup d’état for the newly expanded college athletics conference. Then Scott went on to debut his new Pac-12 Networks concept which would bring even more money into the 12 conference schools & their athletic programs. Well, we all know that money isn’t everything, but it’s a good start especially since other major athletic conferences had previously bragged when announcing what seemed like huge TV contracts shortly before Scott announced his his monster deals with ESPN & FOX. It’s likely that the SEC, the Big-10 & the ACC all felt a little under-appreciated and like they had settled for the first girl who said yes after the Pac-12’s new TV contracts literally dwarfed their own new TV contracts. It was like the coming of age of the West. Finally. And Larry Scott had a lot to do with it. $3 billion over 12 years comes out to $250 million a year for the Conference. Divided evenly between the 12 schools, and each school earns a whopping $20.8 million a year from ESPN & FOX alone. Not bad Larry. So, what’s the problem with Scott? Well, it’s not just Larry Scott, but he has a lot to do with it. And much of it started when Larry Scott’s Pac-12 Networks made their debut. Firstly, in the business of cable television, it would be taught on the first day of class of Cable TV 101 that unless you have cable providers offering your network, then nobody can watch it. And due to this fact, it is very important to get deals in place with cable and satellite TV providers before you start airing your first programming. Or, once again, nobody will be able to watch your programming. Well, this memo somehow didn’t get to Larry Scott. And by the time it did, he just assumed that the Pac-12 Networks would be like the line in the movie “Field of Dreams”: “If you build it; they will come”. He also assumed that he suddenly had the one must-have product for cable & satellite TV providers. It would be the “One Network to Rule Them All”. Well, too bad in real life it doesn’t work that way. So, Larry Scott was left scrambling. Maybe he should have waited to debut the Pac-12 Networks for another year until more cable and satellite TV providers had signed contracts with the conference to feature the Pac-12 Networks. But in his pride, he elected not to do that and went ahead and launched the network. And the problems started immediately. Worst of all, many long-time fans in the actual Pac-12 schools’ local markets had no way to watch their own college sports team play on TV either at home or even when their team was playing away against other conference opponents. It was outrageous. And Scott mostly blamed it on the cable and satellite TV providers. Slowly throughout the football season, this situation improved slightly & and then it continued to improve in different markets a little bit more during the college basketball season. But the big fish did not bite & this left a lot of Pac-12 fans with bitter tastes in their mouth. The big fish in cable and satellite TV is DirecTV of course. And even more so when it comes to television sports programming. Larry Scott just assumed that he could force DirecTV to go along with the same deal that the DISH Network and other cable providers had signed onto. But Scott seemed to forget that DirecTV has long had the best sports programming of any cable or satellite TV provider ever since DirecTV earned exclusive rights to broadcast the NFL Sunday Ticket. With football being by far the most popular sport in America, and the NFL being by far the most popular professional sports league, everybody loved the idea of a deal that could allow people to watch every one of their favorite team’s games, regardless of where a person might be living at the time. So, for instance, I can avoid having to suffer through watching the “Phoenix” Cardinals play and can instead watch every game of my beloved San Francisco 49ers. It always made my blood boil when the Niners would be playing in the nationally televised “game of the week”, but because that terrible professional football mistake plays in Phoenix, Arizona and is from the same state as I live in, the NFL would block out my Niners’ game and my Niners would be preempted by the Cardinals instead. Well, in comes DirecTV and the NFL Sunday Ticket, problem solved, and world peace is on the horizon. So, what cable or satellite TV provider do you think that every sports bar in America would now be required to have? You guessed it: DirecTV. If a bar doesn’t have DirecTV on Sunday, then it doesn’t have any customers either. It was that simple. But Larry Scott’s big deals must have gone to his head & he foolishly seemed to think that his Conference was even bigger than the NFL I guess. Let’s see, Pac-12 has 12 teams dividing $3 billion over 12 years from ESPN & FOX. And starting in 2014, the NFL has 32 teams dividing $39.6 billion from CBS, FOX, NBC and ESPN over the next 8 years. That comes out to over $154 million per team per year for the next 8 years. So, once again, my point is that Larry Scott needs to stop thinking that he’s bigger & badder than the NFL. Since the current exclusivity deal between the NFL & DirecTV to offer NFL Sunday Ticket ends after this coming season, we’ll have to see what DirecTV elects to do. But until the exclusivity deal with the NFL & DirecTV ends for the NFL Sunday Ticket Package, the landscape of cable and satellite TV will remain the same for American sports fans. It is possible that DirecTV could opt against the huge expense of signing another exclusivity deal with the NFL for the NFL Sunday Ticket package going forward, but until then, NFL Sunday Ticket with DirecTV is the main reason to even get cable or satellite TV in the first place. Yes, I’m sure that DirecTV is also playing hard ball & I’m told that I’m supposed to also blame this on them. I also admit that I do not have any inside info on the status of any potential negotiations between the Pac-12 & DirecTV. But either way, I really do think that Larry Scott is the one who is mostly at fault for not getting a deal done with DirecTV to offer the Pac-12 Networks. That’s big problem #1. Big problem #2 has been discussed throughout the media all week & was really the impetus that got me to start this blog. I actually couldn’t sleep because my mind started racing as I went over all of the things that the Pac-12 needs to do to fix its Conference and brand name. And the first thing that needs to be done is for Larry Scott to fire Ed Rush. Ed Rush is the Pac-12’s chief of basketball officials. Well, it has now come out that Ed Rush actually made statements to other Pac-12 refs who were under his command that sounded an awful lot like bribes for them to punish Arizona coach Sean Miller during the Pac-12 basketball tournament. If anything cannot be tolerated in the slightest degree in sports, it would be if there was the appearance that officials were acting on purpose to either favor or punish athletes, schools, or coaches. Anyway, in my next post, I will go more in detail on what Rush did & what needs to be done to him. This entry was posted in Uncategorized and tagged DirecTV, Ed Rush, Larry Scott, Sean Miller, TV Contracts on April 4, 2013 by Zach Cho.